In 1941 RENFE was created. The last steam locomotive was withdrawn in 1975, in 1986 the maximum speed on the railways was raised to 160 km/h, and in 1992 the Madrid Seville high speed line opened, beginning the process of building a nationwide high speed network. Railway transport was first developed in Northern Europe during the 19th century, spurred not only by rapid economic growth, but also by landscapes favourable to railway construction. Economic difficulties and the presence of some of the most mountainous terrain in Europe ensured that railways arrived relatively late in Spain. The first line to be built in the Peninsula was a short link from Barcelona to Mataró opened in 1848, although by that date a line was already working in Cuba - then part of the Spanish empire. It was not until laws were passed in the 1850s making railway investment more attractive to foreign capital, that railway building on a large scale began. One major misfortune was the decision, taken at an early stage, that Spain's railways should be built to an unusual broad track gauge of 1,672 mm (5 ft 5 13⁄16 in), or six Castilian feet). Some believe that the choice of gauge was influenced by Spain's hostility to neighbouring France during the 1850s: it was believed that making the Spanish railway network incompatible with that of France would hinder any French invasion. Other sources state that that decision was taken to allow bigger engines that could have enough power to climb the steep passes in the second most mountainous country in Europe. As a result, Portuguese railways were also built to a broad gauge (roughly the same, 1,664 mm or 5 ft 5 1⁄2 in, but rounded to a Portuguese unit). In 1955 Spain and Portugal decided to halve this difference of 8 mm (5⁄16 in), and defined their gauge to be 1,668 mm (5 ft 5 21⁄32 in), called Iberian gauge. The decision for a national gauge came to be regretted by later generations, when international trade became more relevant, and it also made railway construction more expensive. Apart from the widespread broad-gauge lines, a large system of narrow gauge railways was built in the more mountainous parts of Spain, especially in the north coast of the country, where narrow gauge was the most adequate option. The main-line network was roughly complete by the 1870s. 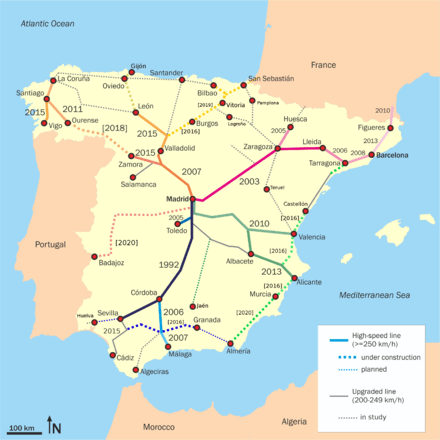 Because of Spain's (until recently) relative lack of economic development, the Spanish railway network never became as extensive as those of most other European countries. For instance, in terms of land area Spain is about 2.5 times the size of Great Britain but its railway network is about 3,000 km (1,900 mi) smaller. 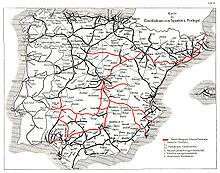 During the Spanish Civil War in the 1930s the railway network was extensively damaged. Immediately after the war the Franco regime nationalized the broad gauge network, and in 1941 RENFE was formed. Narrow gauge lines were nationalized in the 1950s, later being grouped to form FEVE. It took many years for the railway system to recover from the war; during the 1950s it was common to see intercity express trains hauled by 100-year-old steam locomotives on poor worn-out track. In spite of this, innovators like Goicoechea created advanced trains like the Talgo and the TER. Only with the ending of the Franco regime in 1975, and Spain's emergence from international isolation, did the Spanish railway network begin to modernize and catch up with the rest of Europe. Following the decentralization of Spain after 1978, those narrow gauge lines which did not cross the limits of autonomous communities of Spain were taken out of the control of FEVE and transferred to the regional governments, which formed, amongst others, Eusko Trenbideak and Ferrocarrils de la Generalitat de Catalunya. Madrid (Madrid Metro), Barcelona, Valencia and Bilbao (Metro Bilbao) all have autonomous metro services. In 1986/7, many radial routes were closed: thousands of kilometres of passenger lines were axed. The Railway Sector Act of 2003 separated the management, maintenance and construction of rail infrastructure from train operation. The former is now the responsibility of a new public company, Administrador de Infrestructuras Ferroviarias (ADIF), while Renfe (full name: Renfe Operadora) owns the rolling stock and remains responsible for the planning, marketing and operation of passenger and freight services (though no longer with a legal monopoly). Spanish railways have been a target of sabotage and attacks by ETA, and once in March 11, 2004 Madrid attacks. High speed lines operating, under construction and planned. In recent years Spain's railways have received very heavy investment, much of it coming from the European Union. In 1992, a standard gauge high-speed rail line (AVE) was built between Madrid and Seville. In 2003, high-speed service was inaugurated on a new line from Madrid to Lleida and extended to Barcelona in 2008. The same year, the lines from Madrid to Valladolid and from Córdoba to Málaga were inaugurated. The Madrid-Barcelona line is being extended onwards via an international Perthus Tunnel beneath the Pyrenees to Perpignan where it will link up with the French TGV high-speed system. Although the LGV Perpignan-Figueres is finished on the French side, delays on the part of the French government in authorizing construction on its side of the border held up Spanish plans to some extent, and the Spanish side will not be finished until 2012. Further high-speed links are under construction from Seville to Cádiz, from Madrid to Valencia and to Lisbon. The Basque Y, also under construction, will link the three Basque cities. In June 2011, RENFE announced they will suppress the high-speed trains between Toledo and Cuenca/Albacete because of lack of passengers despite an investment of 3.5 billion euros. The average number of daily passengers was 9 between Toledo and Albacete and 6 between Toledo and Cuenca while the daily cost was 18 000 euros. These trains ran over existing high speed lines (the lines to Seville and Valencia) and so the lines remain open, but passengers travelling between the cities must now travel via Madrid. ↑ Kamen, Henry. "The Disinherited". p 216. HarperCollins. Retrieved 2015-04-19. ↑ CCMA. "Renfe suprimeix l'AVE Toledo-Albacete-Conca per manca de viatgers" (in Catalan). Retrieved 2016-02-06.